Keith Duffy brings Sparkle and Shine to the Ball and finds huge success! Keith Duffy brings Sparkle and Shine Ball to the ball and finds huge success! – Pictured above (left to right) Keith Duffy, Leanne Moore, Celia Holman Lee, Lisa Duffy, Miriam O’Callaghan, Terry Ring, Jessica Mc Gurk, Richard Lynch, Brendan Ring. Picture: Dolf Patijn/ilovelimerick. Keith Duffy brings Sparkle and Shine to the Ball and finds huge success! 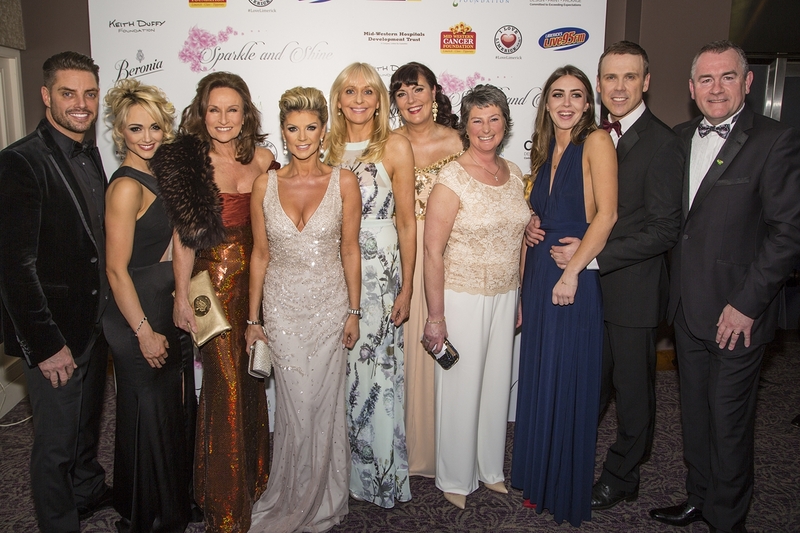 Sparkle and Shine Ball in association with the Keith Duffy Foundation had to be one of the most glamorous events to take place in Limerick this year and was a successful night. The ball was a star studded event with well known faces such as Miriam O’Callaghan, the patron of Clionas Foundation, Keith Duffy representing the Keith Duffy Foundation, Celia Holman Lee and Leanne Moore, one of the ambassadors of Clionas Foundation. The guests gasped as they entered the main reception area as the room was completely transformed into a wonderland. This year the Sparkle and Shine initiative and the Keith Duffy Foundation, founded by Keith Duffy, decided to join forces to raise funds for their respective chosen charities and to give the Midwest region a night that has become one of the most high-profile events of this year. The giving never ended on the night as the tombola raffle rose a whopping €4,000 alone. Then Keith Duffy took to the stage along with his trusty assistant Richard Lynch to start the auction! Members of the audience really dug deep for the charities as there was more than €35,000 for Clionas Foundation, Symptomatic Breast Unit and Mid Western Cancer Foundation. Some of the auction prizes included his and hers Calvin Klein watches from Keanes Jeweler’s in Limerick and Bruce Springsteen tickets, afternoon tea in the Westbury hotel and a stay in the five star Conrad Hotel, Framed drawing by Martin Finnin with signed book of his works and concert tickets to concerts such as Macklemore and Ryan Lewis and Little Mix. The Sparkle and Shine initiative was to raise funds for Breast Cancer services in the Limerick region, they have chosen the Midwest Cancer Foundation and Symptomatic Breast Unit in the University Hospital Limerick, as their chosen beneficiaries. The night was a complete success and the guest who attended partied on into the late hours having given back to these well-deserved charities. We cannot wait to see what next years event will be like and wish all the charities the best of luck!